Chemistry is living proof that the little things matter. It’s atoms and elements… and all the things they combine to create. Which is everything. Generally speaking, chemists focus on the tiniest particles in the universe (the microcosm) in order to help us understand the expansiveness of the universe (the macrocosm). Chemists discover energy in some form or another, and then use that knowledge to harness that energy to extend life and create better techniques and inventions which make life easier, safer or more comfortable for all of us. How do I become a teacher in this field? An understanding of the minute pieces that make up our universe also enables us to go on to make new creations and new discoveries. For example, without the discovery of oxygen in the 1770s, no one would be able to go scuba diving because we wouldn’t know how to bottle oxygen. In turn, we would have been much more limited in our underwater exploration, and thus been deprived of a deeper understanding of our oceans and of our planet and life as a whole. Over the past two centuries, there has been a whirlwind of chemistry-related discoveries, from the exploration of atomic theory to the discovery of bacteria as disease-causing agents. And as a chemistry teacher, you can help your students discover these scientific truths for themselves. Chemistry isn’t a required course at most high schools. However, the up side is that students who enroll in the course have at least some motivation to learn. If they’re enrolling in a chemistry course, you know they’ve already completed a basic science course and have discovered enough interest in the scientific process to explore further. Many of these students are also on the Advanced Placement track, and thus won’t need to be needled into learning. Hazel Bishop, first female member of the Chemists’ Club in New York, invented smear-proof lipstick. Marie Curie, pioneered radioactivity research, two-time Nobel laureate and first female professor at the Sorbonne. Irene Joliot-Curie, Nobel Prize for synthesis of new radioactive elements. Rosalind Frankly, used x-ray crystallography to see structure of DNA; her data was used to propose the double-stranded helical structure of DNA. Alice Hamilton, first to direct investigations into industrial hazards in the workplace, many employee protection laws were enacted. However, a major challenge for chemistry teachers is helping students connect what they’re learning to everyday life. Therefore, teaching students to ask great, even unusual questions is an important part of being a chemistry teacher. For example: What are tears made of—and why do I get them every time I cut an onion? Why are coffee and smoking addictive? Why are certain people more attracted to each other—in other words, why do they “have a chemistry”? As you help your students investigate and discover answers to these questions, you’re also teaching them critical-thinking skills (and creative-thinking skills) that will serve them for a lifetime. All along the way, you’ll not only be teaching matters of chemistry but also reinforcing math skills and vocabulary that are necessary to understanding and solving chemistry problems. Students will regularly create and apply math formulas during the course of their lab work. Chemistry teachers have the rare opportunity to teach by doing, rather than simply by telling. Sure, chemistry teachers do their share of lecturing and bookwork instruction, but they also get to teach in a lab that allows students to perform hands-on experiments. Students start by developing a hypothesis, think of possible ways to prove or disprove it, and then take their ideas to the lab to see if their hypothesis works (or not…). Every new discovery begins with a problem or something students are curious about. It’s an exciting process, and chemistry teachers get to watch the amazement of scientific discovery on the faces of their students. Initial classes start with the building blocks—atomic particles and the periodic table—and build up from there, naming compounds and writing formulas. Along the way, they’ll also be exposed to scientific history and the discoveries and theories of many of the great scientists, from Democritus to Newton to Niels Bohr. You can die from drinking too much water. If you mix half a liter of alcohol with half a liter of water, the volume will be less than one liter. You can’t taste food without saliva. Fish scales are a common ingredient in lipstick. A fresh egg sinks in water; a stale egg floats. Seventy-eight percent of the human brain is water. Science teachers are usually also responsible for the science fair, which can be a very rewarding annual event. 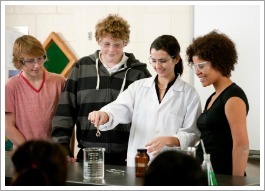 Chemistry, biology, physics, and math teachers often work together to help students develop scientific experiments that can prove or disprove something for to show off to the student body and parents. Other challenges high-school science teachers often report facing including learning to incorporate new technology into their instruction, teaching special-needs students, and developing inquiry-oriented teaching methods. Also, as scientific discovery continues to grow in leaps and bounds, teachers will be expected to keep up with these new developments and share them with students, and the rest of the science department, as they become relevant to the curriculum. In all likelihood, yes, you can find a job as a chemistry teacher. Scientific discovery is on fast- forward and America is racing to keep up. In fact, the Business Higher Education Forum (BHEF) has identified a projected 280,000-person shortfall in new math and science teachers by 2015. Thus, the federal government has been ramping up science education as a major priority for U.S. education for more than a decade. Science, technology, engineering, and math (STEM) has been identified as the core curriculum public schools need to focus on. Chemistry teaching jobs are available everywhere, but they are especially needed in rural schools, economically struggling districts, areas where poverty is of concern, and inner-city schools. These areas are underserved and experience difficulty in finding well-qualified science teachers. Because of the lack of dedicated science teachers, poor and minority students often don’t receive adequate science education. Teaching at a private or charter school is another option. The pay and benefits are generally not as good as those offered by public schools, but the tradeoffs are that classrooms are often easier to manage because there’s more structure and discipline, and that teachers often have more leeway in the subject matter they can teach and where to concentrate their efforts. The average public secondary school teacher earns $54,390, with starting salaries ranging between $30,000 and $40,000. Salaries, of course, vary, by school district and state. Teachers are compensated for experience and time on the job. Salary is not the only consideration when looking at a teaching position, however; insurance, retirement, and paid vacation days are also a strong consideration. Chemistry teachers who are willing to relocate to high-need areas are also often given incentives such as student loan forgiveness, contract signing bonuses, and grant money for increased salaries. Those teachers who do additional training, especially those who work their way to a master’s degree, also receive pay increases. Also, once teachers obtain their master’s degrees they qualify for a variety of administrative positions, which constitutes a significant pay jump. But it’s possible to stay a teacher and still make more money. Extra-curricular activities are another way that teachers can increase their pay—for instance, acting as an advisor to a student science club or signing up for bus duty. To become a chemistry teacher, you’ll need at least a bachelor’s degree in chemistry. Completion of a teacher certification program is also a requirement. There may be other requirements as well, because every state is different. Visit the Teacher Certification website to find out exactly what your state requires. For many students online training is necessary to switch careers or to juggle family responsibilities. Many universities offer online courses and even entire degrees online, though with chemistry you will likely have to participate in lab hours. Teacher certification programs can also be completed online in many states. Following the classroom certification part of the program, at least one semester of student teaching is required. Teacher candidates have the opportunity to get their hands dirty in the classroom and will be mentored by a veteran teacher in class management, teaching style and the tricks of the trade. Before teachers can receive their license they must pass a Praxis or state exam, as well. If you love science and you want to turn kids’ curiosity on, teaching them how to ask the scientific questions of discovery, then becoming a chemistry teacher might be your calling.